Happy Woman using an app on her smart phone. 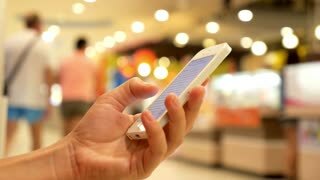 Close up of Woman Using Mobile Smart Phone in Shopping Mall. Close-up round view of a young caucasian blonde woman in a shirt using her mobile phone on a street, slow motion.